Left, Mason jars are fastened to a piece of salvaged wood with steel downpipe brackets and put to use in fun and inventive ways. Hung on a wall, the grouping of jars can be planted with flowers or herbs, used as vases for cut flowers or reserved for holding cutlery and wooden utensils. 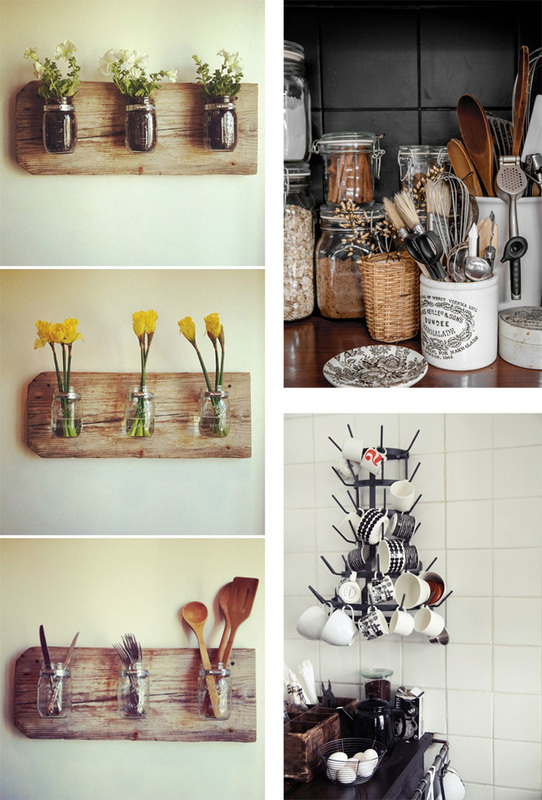 Top right, old Dundee ceramic marmalade jars are used to corral kitchen utensils while an old rack, bottom right, keeps frequently-used mugs easily accessible. 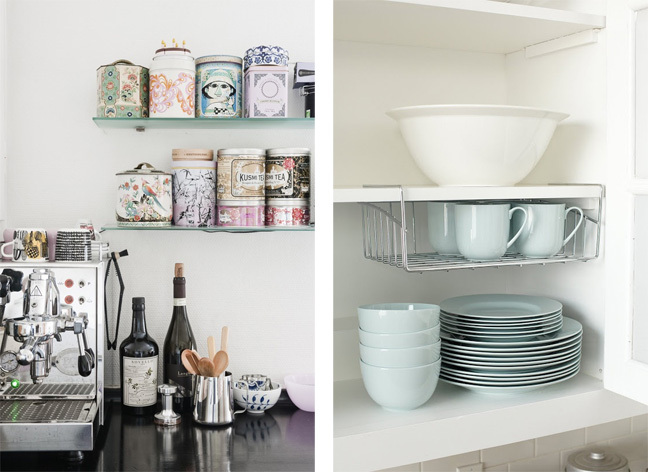 Left, decorative tins found at flea markets and tea shops do double duty: a pretty design element in a monochromatic kitchen and storage for all manner of small kitchen treats and supplies. On the counter, a stainless steel jug holds wooden spoons and spatulas. Right, a wire tray is used on a shelf inside a kitchen cabinet to store mugs, saving space. Tins and trays of all kinds can be used for a multitude of storage and organizing purposes. The enameled tins on the left look lovely in a grouping while keeping small supplies out and ready to be used. 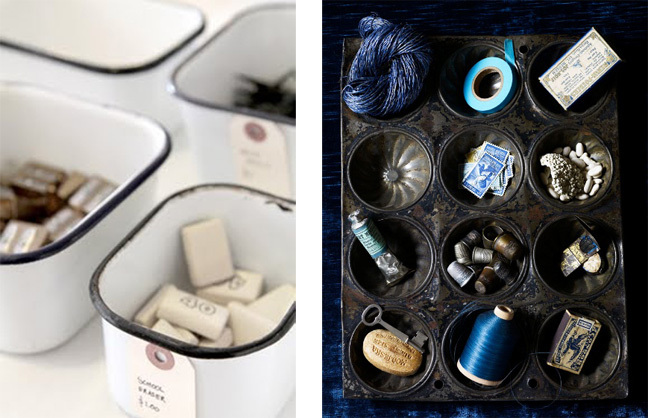 The tart tin on the right holds a variety of sewing supplies in its indented compartments. It can be kept out on a work surface or hidden in a wide drawer. A small filing cabinet next to the bed creates a functional night stand and lends a surprising, industrial design element to a bedroom. 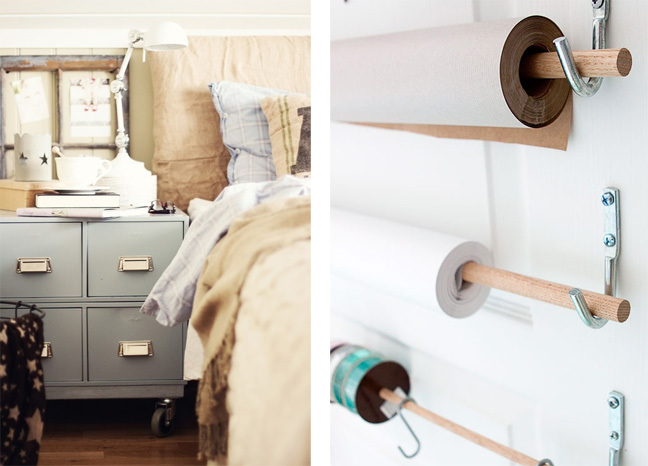 On the inside of a closet door, steel mounted hooks hold wooden dowels to keep wrapping supplies at hand and in order, maximizing vertical space and eliminating potential clutter.